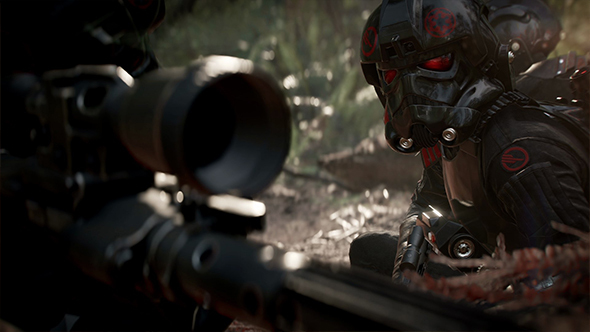 It was pretty clear even before Star Wars: Battlefront II launched that the game’s progression system would be getting an overhaul, and EA have now confirmed major changes are coming to the game in the near future. Check out our list of the best multiplayer games available on PC. What these changes actually are and when they’re coming, however, are left for us to guess. Further details will be forthcoming in March, EA say. In the meantime, they’re introducing a limited-time mode called Jetpack Cargo, which will go live in February. According to the post, this will pit two teams of eight players against each other in “a frantic, fast-paced way to play.” Again, EA are light on specific details, but presumably the mode will involve flying around with jet packs. Battlefront II faced so much public outcry over its loot-crate and progression systems after its open beta that EA opted to disable microtransactions before the game launched, saying at the time they would reexamine their approach before re-introducing them to the game. Even so, the game managed to attract attention from politicians in both Europe and the United States, and at this point it’s still an open question whether microtransactions will return to the game at all. When we have more information on what EA have planned for their ill-fated Star Wars shooter, we’ll let you know.